What's the "be" for anyway? This history has been compiled based on an oral accounting by Ron DuPlain, recorded at beSwarm 9 (May 2018). Please contact us if you have information you'd like to add to this local history. It all started in 2003, when Tim O'Reilly (yes, of O'Reilly Media fame), held an invitation-only conference focused on the future of technology, called Foo Camp. "Foo" is the first nonsense word in programming that developers use to denote something not yet named; the term was also backronymically interpreted as Friends of O'Reilly. The format of this conference was based on the organizational principles of the Open Space (Technology) movement, which is, in the words of its website, "a simple way to run productive meetings, for five to 2000+ people". During this same period, a group of UVa employees started a meetup group with the goal of trying to get one technologist at a time into the fold of more of a modern mindset around software. At the time, software developers throughout UVa were largely siloed. Contrary to what we think of as the norm today, this group often met during the workday, rather than after. To capture this modern mindset, the idea of operating on tech's "bleeding edge", they called the group beTech. Up until 2018, when beCamp was rebranded, the logo remained as the sole remnant of beTech. beCamp was a breakout from beTech; inspired by BarCamp, the first beCamp was held in 2006, in the backyard of local technologist Steve Stedman. Starting with 2007, and up until the becamp.org website was established, beCamp was organized using a wiki kept on barcamp.org/becamp. Whatever topic of most interest to the room is the one currently in discussion. Whoever has perspective on the topic has an opportunity to take the floor. The upshot of this is that any presenter who happens not to be the top expert among those assembled, or who wanders into gaps in his or her knowledge, is likely to be offered key perspective from another attendee. This is something that rarely is expected to happen at a traditional conference. beCamp is the product of iteration. Many things have been tried; some of them stick, some of them don't. As an example, take the "present", "learn", "share" options on pitch topics. This clarification was suggested by Ron DuPlain, based on two years of listening to feedback at the retrospective session (at the end of each beCamp). Pitches had long been a staple of beCamp, but an up-vote alone was sometimes not sufficient to lead to a successful session. Sometimes sessions would be cancelled because no one would be an expert on the topic. Or, sometimes someone wanted to present, but an audience member expected to be able to contribute. Specific to beCamp, specifying a Present, Learn, or Share has now become a tradition. beCamp itself has also inspired another breakout, beSwarm. Many people had expressed the feeling that a year was too long between beCamps, but two beCamps a year would be impractical, given the amount of planning that goes into an "unconference". 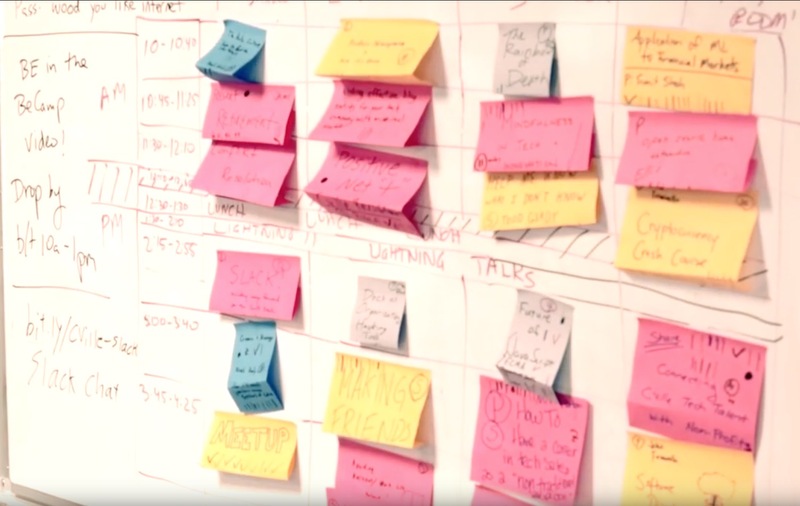 An unconference is not unorganized; it requires a lot of upfront planning to accommodate the intentionally omitted program plan. Ron DuPlain started beSwarm in 2010, with immediate co-organizational support from John Chapin. The first beSwarm was held in February 2010; the format is verbatim Open Spaces: people just announce what they are doing and do it. Basically, it takes the spirit (though not the pitches) of beCamp's Friday night and does it on a Saturday. beSwarm itself led to beCraft, a meetup devoted to software as craft, that was started in 2012 by Stuart Leitch based on emails he collected at beSwarm that year. Stuart had immediate co-organizational support from Al Tenhundfeld, and later, Cushing Whitney. Although it no longer meets, it was responsible for inspiring many other tech-topic meetups that are still going strong. Additionally, the Cville Slack team was began during the 2015 beCamp retrospective; this was a decision to migrate an existing local community of Internet Relay Chat (IRC) users to a new platform. This community Slack team currently has over 1,000 members. While beCamp will remain a standalone, singular annual event, the community that organizes and funds it will also support several meetups and community events throughout the year. While beCamp and beSwarm trace their roots to the tech community, the mission that drives these events is one of collaboration and inclusivity that includes but is in no way limited to technology-related topics.